Brooks Robinson played 23 seasons for the Baltimore Orioles, emerging as a fan favorite and solidifying his spot as the the first Orioles player memorialized in Cooperstown. The following top list brings together the key baseball cards from Robinson's lengthy and legendary career. Shop for Professionally Graded Brooks Robinson Cards on eBay. Amazing defensive skills earned him the nickname "Mr. Hoover" and "The Human Vacuum Cleaner" and his 16-straight Gold Glove awards made Brooks Robinson the best defensive third baseman in baseball history. He could also combine his skills in the field with an ability to hit for power as he notched at least 20 home runs in a season six times. 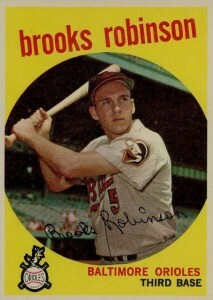 Along with winning an American League MVP award in 1964, Robinson played on 18 All-Star teams and had the distinction of winning an All-Star MVP award for the losing team. Also notable, he hit into four triple plays in his career, more than any other player. 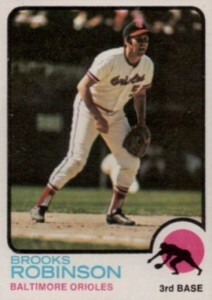 Collectors can locate the final Brooks Robinson card from his active playing days in 1977 Topps. In 1978 Topps, the set included a record breaker card honoring his historically long career with a single team. Speaking to his character, 1972 Topps included a Robinson card that noted his Commissioner's Award honoring the top player that exemplified baseball, on and off the field. 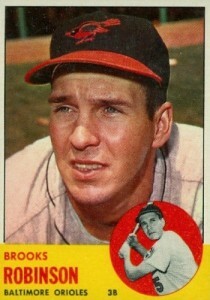 As one of the best known superstars of the 1960s, Brooks was included in nearly all of the oddball Topps sets from the decade. You can find these appearances in such sets as 1963 Topps Peel-Offs, 1964 Topps Stand-Ups, and 1966 Topps Rub-Offs. Still a popular player, Brooks Robinson is frequently featured in contemporary sets, including 2015 Topps Stadium Club and 2014 Topps Allen & Ginter. A particularly notable recent card of Robinson can be found in 2007 Upper Deck Masterpieces and features a painted card with many parallels. Being a popular baseball player for 23 seasons logically means that you have a lot of trading cards in your honor. It also means that building a list of just ten of Robinson's best cards from such a large pool can be difficult. For the sake of this article, card value was considered along with design and popularity in an attempt to build a comprehensive and complete list. Robinson's 1973 Topps cards is one of the surprisingly few cards that feature him playing third base. Along with one of his 1971 Topps cards (see #6 on this list), every other Topps card features him at bat or in a staged pose. The back of the 1963 Topps card for Robinson tells us that he led third basemen in fielding percentage in 1960 and 1961. He continued that statistical dominance throughout his career and, at the time of his retirement, he had the highest fielding percentage of anyone to have played the position. 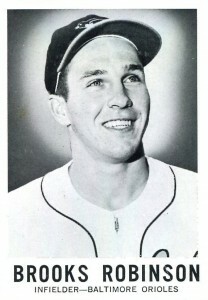 While not an offensive dynamo, Brooks Robinson had some solid offensive seasons over his career. In his MVP-winning 1964 season, he led the league in RBIs and was honored in the 1965 Topps set for the feat. Robinson shares the 1964 RBI Leaders card with both Mickey Mantle and Harmon Killebrew, making it one of his more popular cards. 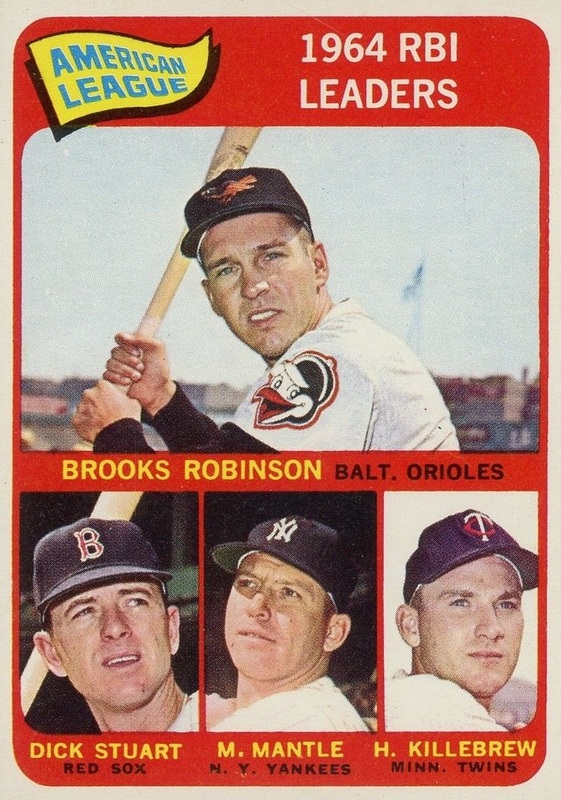 1967 Topps included Brooks Robinson along with teammate Frank Robinson and their manager Hank Bauer on the first card in the set. 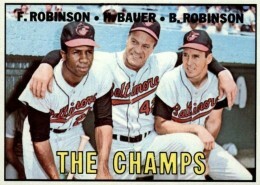 The card honors the Word Series-winning 1966 Orioles team that swept the Dodgers in four games. When the Orioles began adding players to their team Hall of Fame, the first two names up for inclusion were Brooks and Frank Robinson. 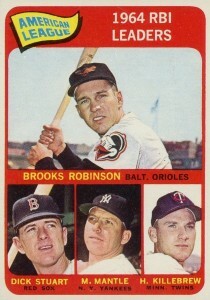 Their careers with the Orioles will always be tied together and fans can find another combo card for the Robinsons in 1968 Topps. 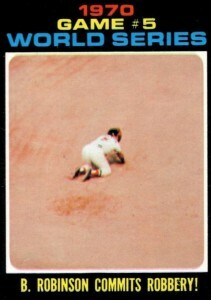 The Baltimore Orioles won the World Series for a second time in 1970 and Robinson is featured in 1971 Topps on a card that documents Game #5. The photo is among the most startling included in any Topps set as it can be initially confusing to determine what is being shown. Only by reading the caption of "B. Robinson Commits Robbery" do we understand that it is Brooks Robinson diving for a ball on the infield dirt. Robinson collectors should also track down card #300 from the same set which features him at the end of a swing that, based on the expression on his face, clearly missed the pitch. The 1960 Leaf set is arguably the most beautiful black-and-white set and Robinson's smiling photo with the white halo around his cap makes for a beautifully composed trading card. Through the different series in 1959 Topps, the colors used on the reverse of the cards changed slightly. On cards in the earlier sets, including Robinson's #439, stats and player information were in green and red. After card #507, Topps used black and red colors. While the color change doesn't necessarily increase the card's value, it is a handy indicator to let you know if you are holding a high-numbered card from one of the most popular sets of the 1950s. 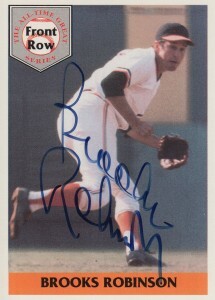 While he batted and threw right-handed, Brooks Robinson is left-handed for everything else in life, including signing autographs. His signatures are frequently slanted to the left and also very flamboyant and large. This makes his certified baseball card autographs a mixed bag of options that are largely crammed into too small a space or signatures that are so big they take over the card. One of Brooks' earliest certified autographs, put out by Front Row in the early 1990s, offers a nice on-card signature with plenty of signing space. Prices are also very reasonable. 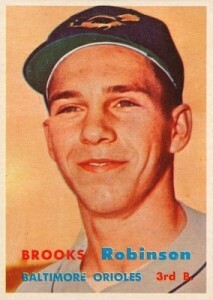 I can't imagine Robinson was very pleased with the photo Topps decided to use on his second-year card in 1958 Topps. It looks like he might be about to shout something at a teammate, or maybe even sneeze, but we may never know for sure. This card serves as a nice jumping-on point for collectors on a limited budget as the price of the card at the top spot on the list can set you back quite a ways. 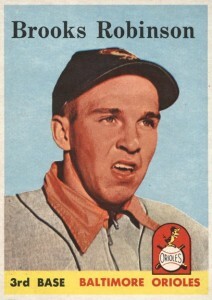 In a set famous for its rookie cards, Brooks Robinson's debut card in 1957 Topps is frequently the most valuable rookie option. Its value competes strongly with the base cards of heavy hitters like Mickey Mantle and Ted Williams as well. 2000 Bowman’s Best Brooks Robinson Auto Issue - #FR2B PSA 9! Orioles! POP 2!